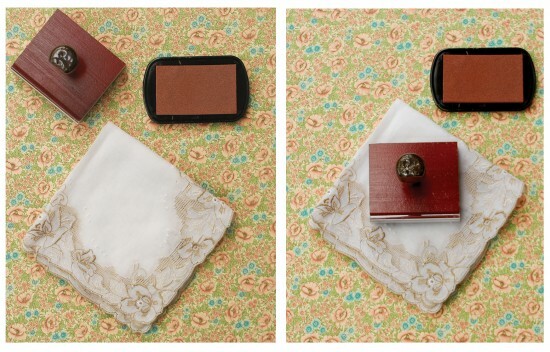 Call us nerdy, but we’ve always been obsessed with vintage handkerchiefs. 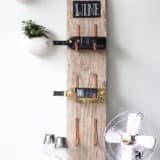 Beyond the fact that they’re stunning bits of culture and history in and of themselves, they’re also incredibly versatile when it comes to up-cycling! 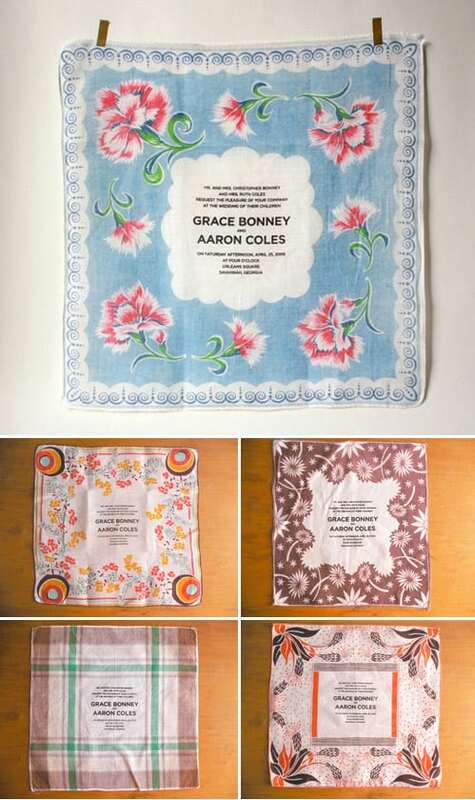 Believe it or not, there are all kinds of creative things you can transform a simple handkerchief into. 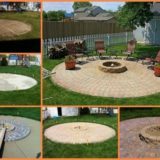 One kind of project in particular, however, has caught our attention especially well as of late and we just cannot stop looking at options even though we don’t have that many events to invite people to. 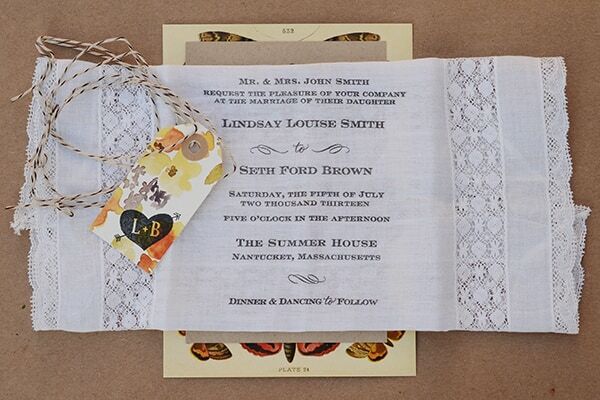 We’re completely enamored by handmade handkerchief invitations! 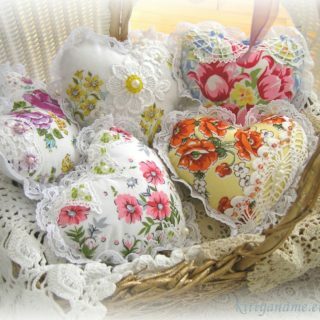 Have you got a stunning set of vintage handkerchiefs with cute borders and lovely details that you’d happily create elsewhere in your home or crafting endeavours because you like it so much? 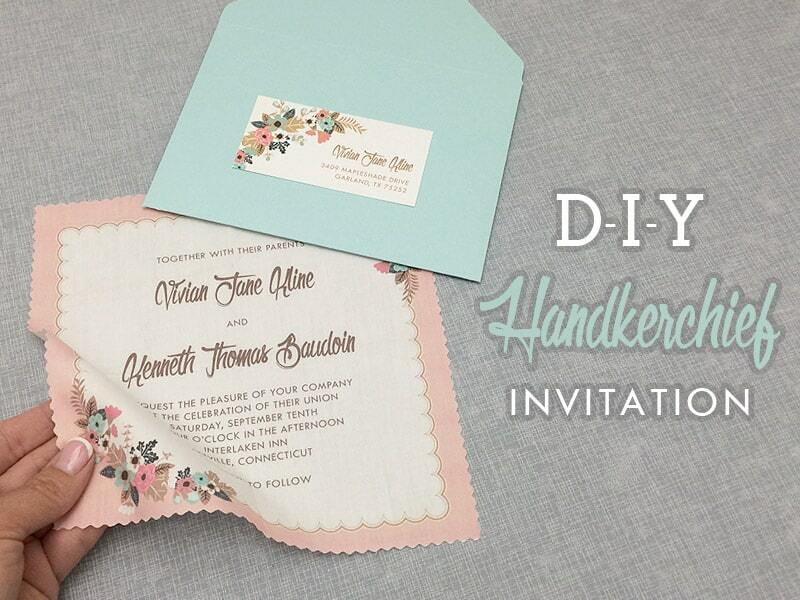 Then we have a feeling this lovely DIY invitation idea might be right up your alley! 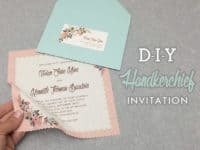 Download and Print guides you through the process of designing, templating, and printing out custom invitation labels for your envelopes that match the border of your handkerchief perfectly. 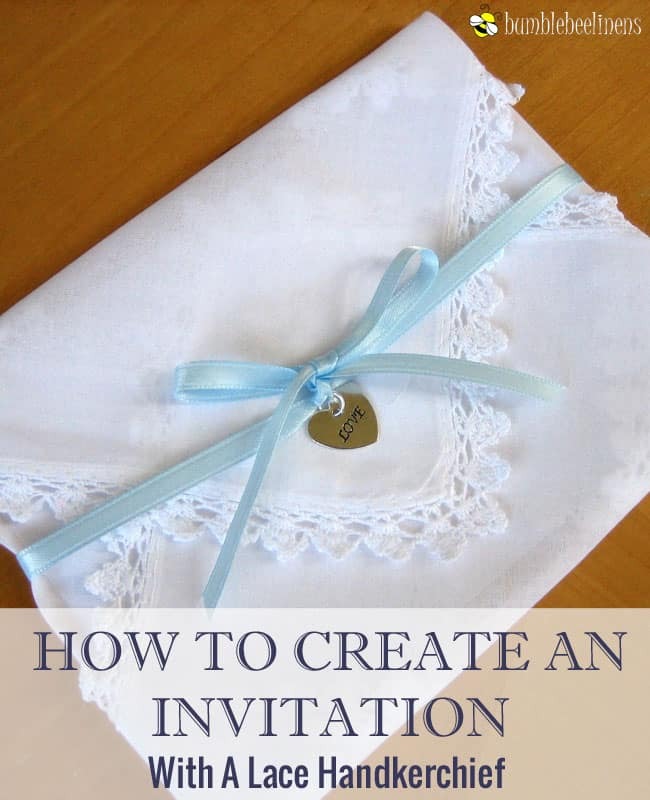 Perhaps your pretty vintage hanky is rather plain and you’d like to keep whatever invitation details you add to it quite simple because you don’t want to detract from the lovely, delicate looking lace all around the border? 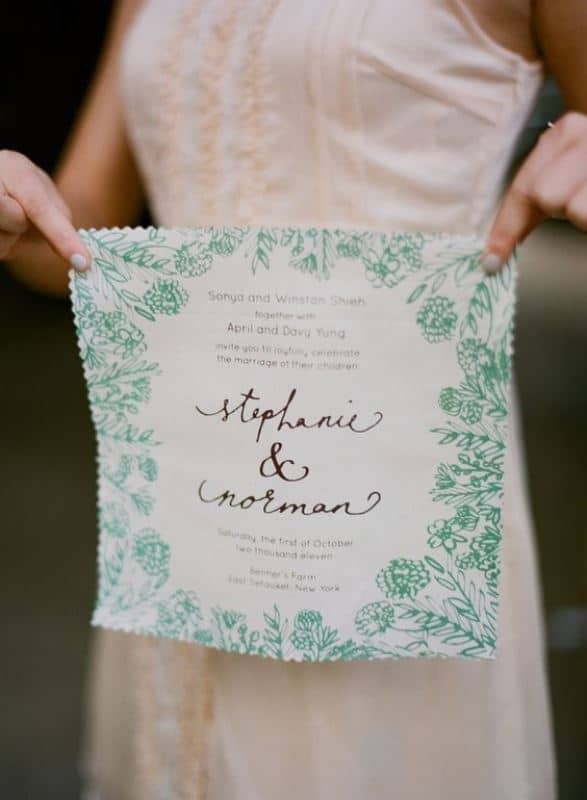 In that case, we think you might prefer this simple ink stamp idea featured on Oh So Beautiful! 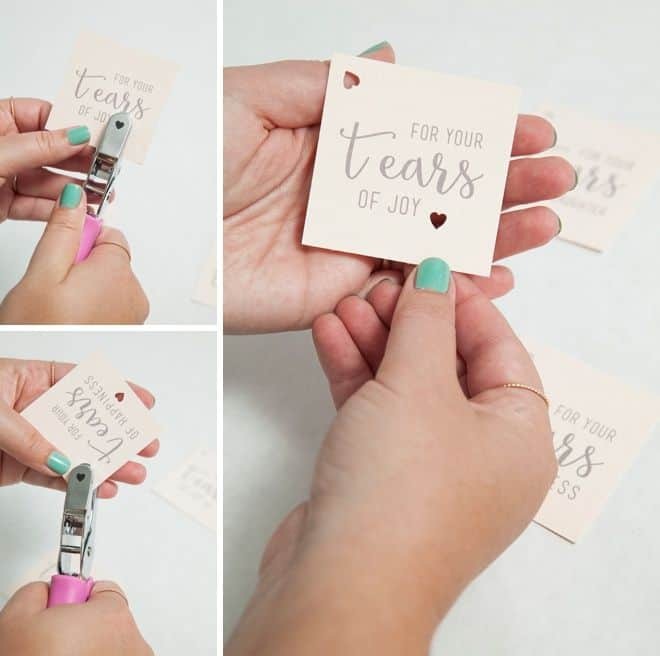 They show you how to add event details using careful but simple stamping techniques. 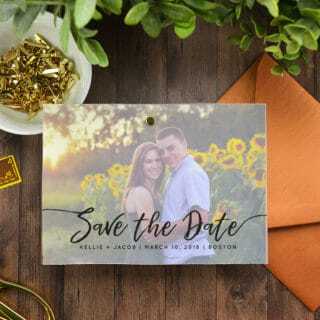 Is the event you’re planning for actually going to be the perfect example of “rustic chic” in aesthetic, so you’re absolutely looking for a hanky invitation design but you’d also like to find one that’s a little less fancy looking than what we’ve shown you above? 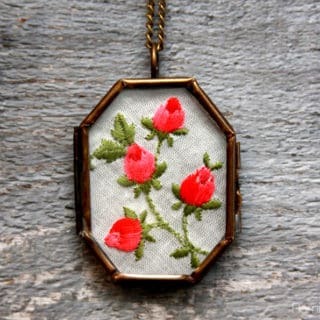 In that case, whether you’re buying vintage hankies and customizing them or making your own from scratch just to look vintage, we’d absolutely suggest taking a look at the way The Antique Door frayed the edges of theirs before adding text! Did we catch your attention when we started talking about plain handkerchiefs because yours is are completely plain and you’re actually looking for a way to help jazz them up a little and give them a bit of visual interest? In that case, we think you might find this botanical border idea outlined on Wedding-O-Mania very interesting! 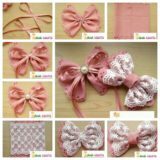 Their tutorial guides you through the process of creating a similar border to the one you see here, but in the colour of your choice. 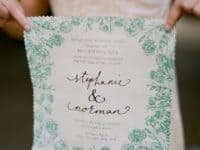 Were you a pretty big fan of the idea of stamping words and details onto your hanky invitation because you’ve always been a stamp enthusiast and you have a wide collection of fonts, florals, and finer shapes? In that case, we absolutely think you should take a look at how Oh So Beautiful Paper used stamps to create a detailed, delicate, and vintage looking border all the way around the edge. 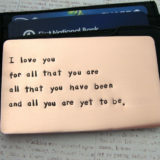 Using a light brown ink reinforces the pretty vintage effect! 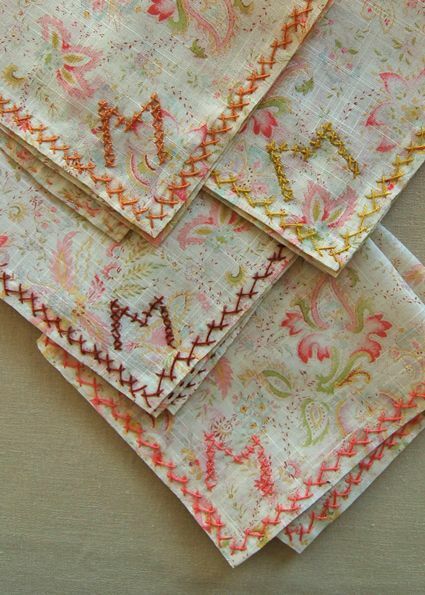 Do you have all kinds of different handkerchiefs but no repeats or pairs that really match each other? Well, if you ask us, that’s completely okay! 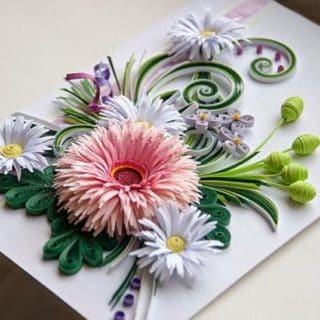 Especially if the event you’re making the invitations for is a family function, most people will simply concentrate on how pretty your finished product looks and how much effort went into making the invitations yourself, rather than giving any thought to whether or not theirs matched the next person’s. Take a look at how Junebug Weddings made this adorably mismatched set! 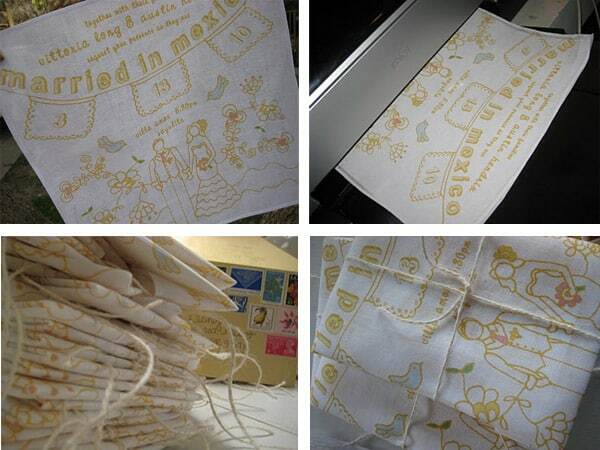 Besides making great invitations, customized vintage handkerchiefs also make fantastic wedding favours! 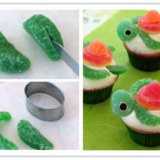 Just because you’re giving them as a gift, however, doesn’t mean you have to change them up too much. 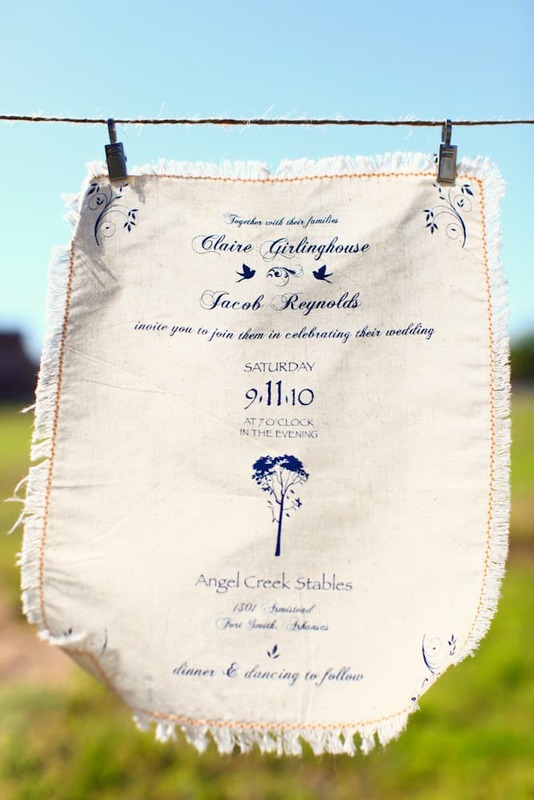 Try choosing a set of plain hankies you love just the way they are and instead attaching a funny tag about wedding tears to the corner, just like Something Turquoise did here. 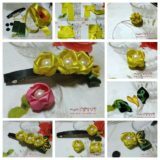 Have your DIY and artistic skills actually always lied more in the area of sketching, illustrating, and drawing by hand? 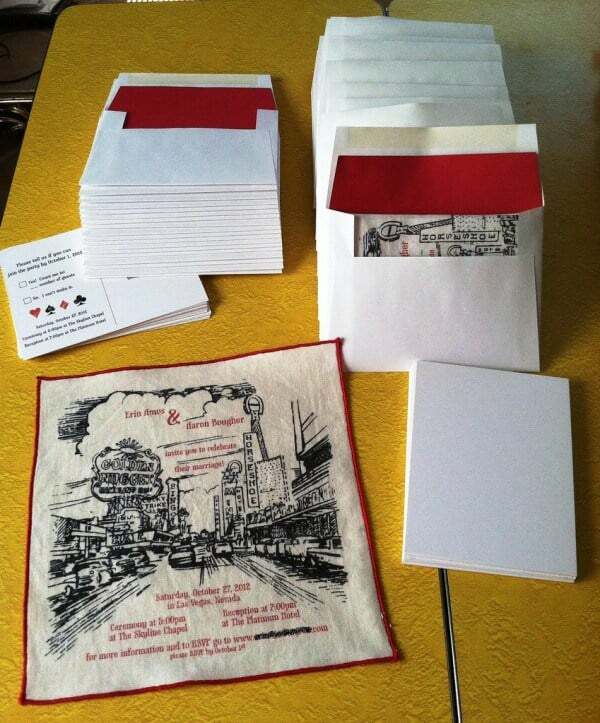 Well, what if there was a way to combine that with the idea of making your own handkerchief invitations? 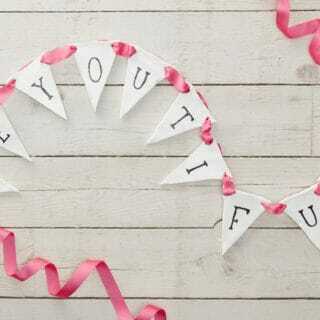 We’re pretty pleased to tell you that, thanks to this cute tutorial on i-DIY, there is! Now you can reprint your very own art onto the fabric instead of just stamping or having to re-draw the image on every single one by hand. Then again, what if you wanted to draw right on the handkerchiefs because creating art on different unconventional mediums is actually your very favourite kind of DIY to do? 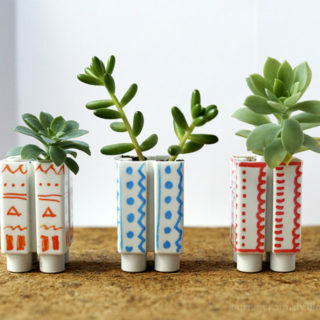 In that case, we definitely think you should take a look at this idea featured on I Do DIYs! 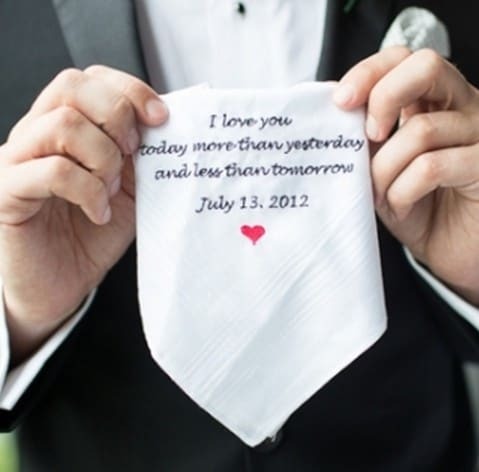 They’ve created a little handkerchief love note rather than an invitation, but we’re sure you can see how the basic idea transfers. Are you actually a little bit pressed for time and in need of many DIY custom hankies, so much so that you’re just not sure you’ll have time to get them all done by hand? In that case, maybe learning how to print onto fabric at home is the best idea for you! 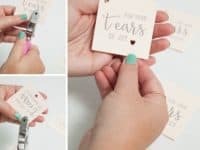 This tutorial from Offbeat Bride is a great resource for printed hanky invitations because it shows you how to make it happen with nearly any image or font, making them completely customizable. 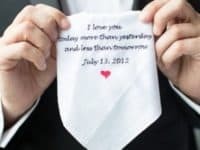 Were you originally intrigued by the idea of handkerchief invitations but you didn’t have time and now you’re looking for another way to incorporate hankies into the celebration? Perhaps you actually did send those DIY hanky invitations out but you’d like to keep that theme up throughout the rest of the event? 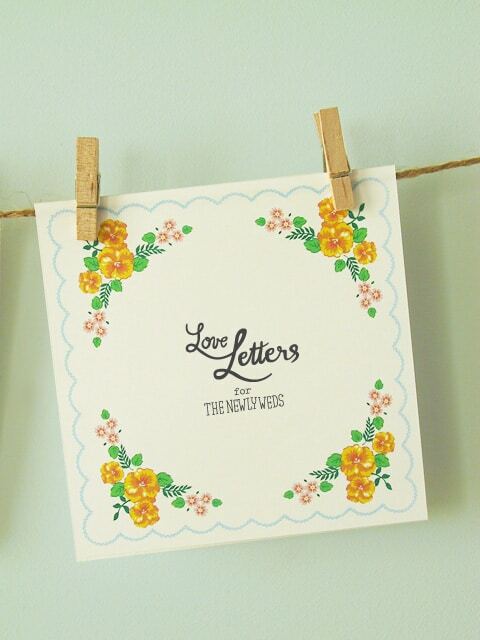 Either way, we think these awesome handkerchief love notes hung on a faux clothesline are a great idea! Eat Drink Chic made theirs for a pair of newlyweds so their guests can leave them lovely little greetings, but you could customize yours for any occasion or guest of honour. We’ve shown you a few designs now, made in a number of different ways, that involve more than one colour in the stamping, printing, or hand drawing of the event information, images, and borders. 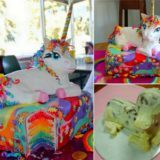 If your intention is to try and stick with a purely vintage looking aesthetic, however, then including a lot of colour might not actually get you the kind of satisfactory finished product you’re looking for. 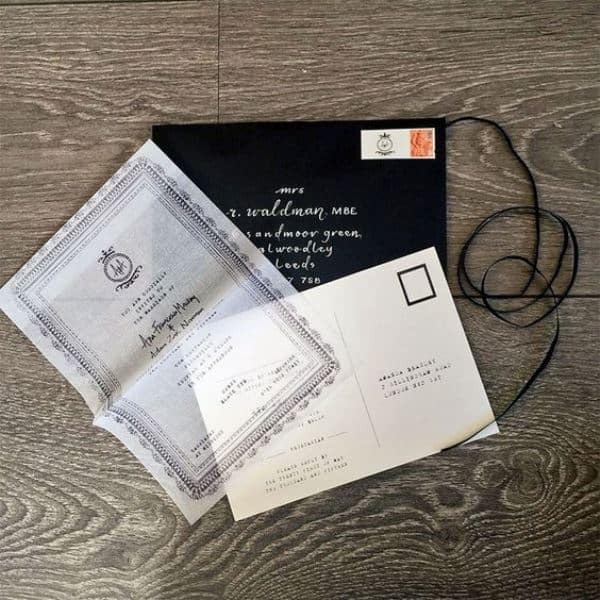 Instead, we’d suggest taking a look at how Wedding-O-Mania made lovely looking monochrome hanky invitations, keeping things within a strict colour scheme and on a plain background. 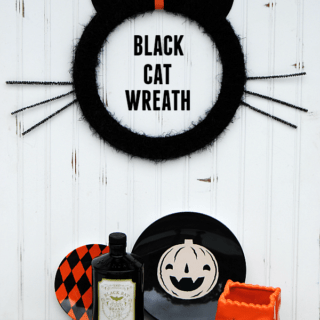 We’ve talked a whole lot about weddings, birthdays, and other such pleasant events, but what if you were actually searching for ideas well in advance of Halloween so you can throw the coolest Halloween party ever? 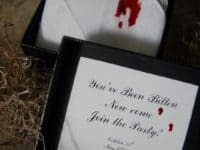 Perhaps you actually are preparing for one of the traditionally jovial events we just listed, but you’re simply choosing to give it a darker theme than usual? 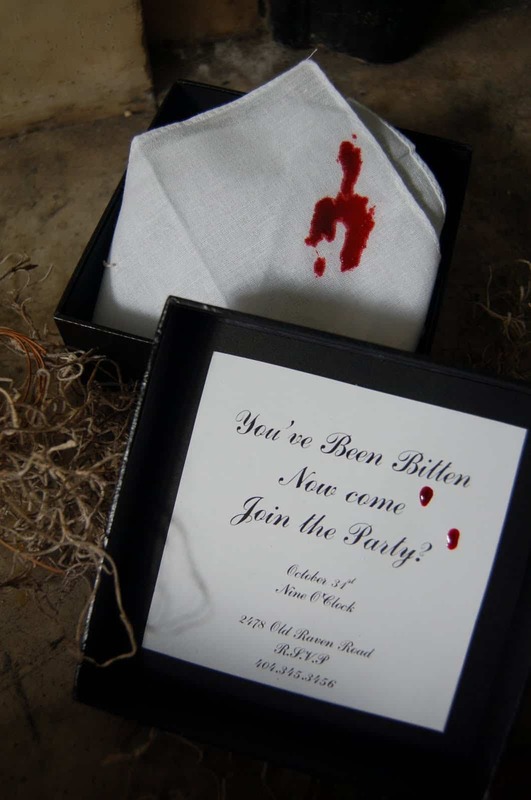 Well, if you’ve ever loved vampire fiction, then we have a feeling you’ll be very intrigued by these blood stained handkerchief invitations featured on The Basics! 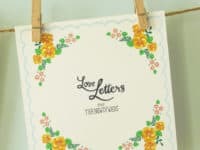 When you started thinking about making a DIY handkerchief invitation, were you actually hoping to include something a little more handicraft based, perhaps putting your needlework skills to good use? 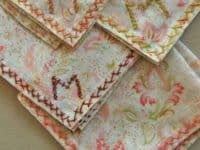 Then maybe this embroidery based monogram invitation idea featured on Purl Soho is the project for you! 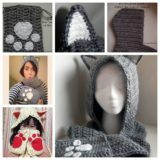 Besides being completely adorable, this is a great idea for beginners who are just learning how to cross stitch or embroider because it’s very simple, despite being so cute to look at. 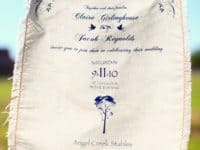 Perhaps you actually already have invitations printed but you still kind of have your heart set on incorporating handkerchiefs in some capacity? 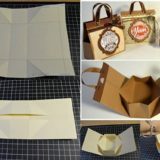 Then maybe this adorable folded handkerchief envelope idea is a great alternative for you! We love the way Bumblebee Linens outlines not only how to fold the hanky to make the envelope but also how to keep it closed and in place with a pretty silk ribbon.